After my epic feast at Elizabeth the previous night, I was amazed that I woke up actually hungry again. I ventured out once again to the Windy City, this time taking an Uber X ride to save some time… or so I thought. A very unwise path to downtown by my driver had me sprinting before my reservation ended. Thankfully, I arrive with 2 minutes to spare and was granted access to Rick Bayless’ famous tribute to all things Mexico – Frontera Grill. Having grown up in Texas, I tend not to favor Mexican restaurants when dining out as it’s just too familiar to me. However, having read extensively about Bayless and his true passion for Mexican food, I figured it was worthy of a visit. I had originally tried to get into his upscale Topolobampo but it was booked out 2 months in advance. Still, Frontera was known for its brunch so I figured it out still be a worth substitute. While the menu did have some familiar Mexican food tropes, including the tacos al carbon that my server seemed to be pushing hard, there were also some very interesting combinations and elements not typically seen on a menu like this. 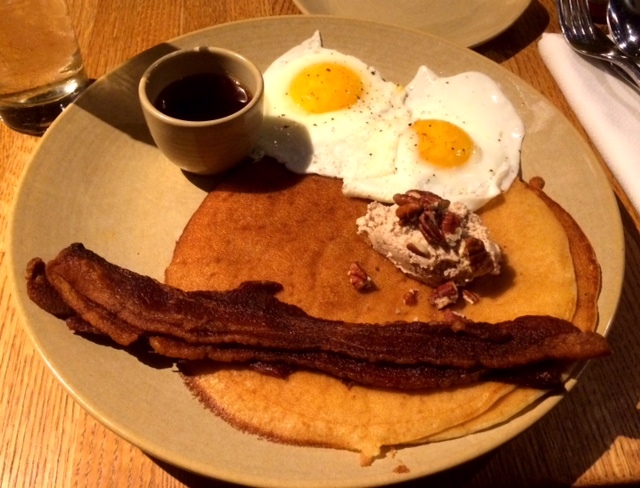 One that immediately caught my eye was on their Specialties list – Frontera Hot Cakes – Four Sisters’ Garden corn cakes with whipped goat cheese and pecans, two farm sunny side up eggs with Burton’s maple syrup and red chile glazed bacon. The corn cakes were light and fluffy, and served as a perfect vehicle for the very strong but delicious whipped goat cheese. The pecans were a nice touch and added some texture to each bite. The bacon had some heat due to the red chili glaze but wasn’t overpowering. Overall, a very nice take on a traditional breakfast. Because I had gotten there so late, it was almost 3PM by the time I finished the corn cakes. I debated whether or not to get something else, opting to hold off and perhaps get something later when wandering around town. 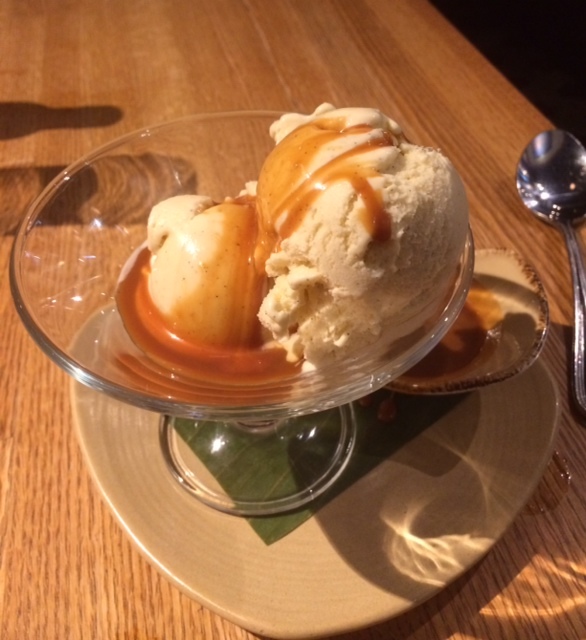 However, then I saw that one of the desserts was home made Mexican vanilla ice cream mixed with Torres brandy and a goat milk caramel sauce. And that was simply too good to pass up as I’m a sucker for boozy ice cream. Although pricey at $9, this was truly heaven in a bowl. The Mexican vanilla beans had a distinctive taste to them and the Torres brandy flavor was bold and plentiful. However, what took it to the next level was the truly amazing goat milk caramel. Called catena, the warm thickened goat milk with gooey caramel oozed perfectly over the top of the ice cream, creating that wondrous warm melted taste of so many flavors mixed together. 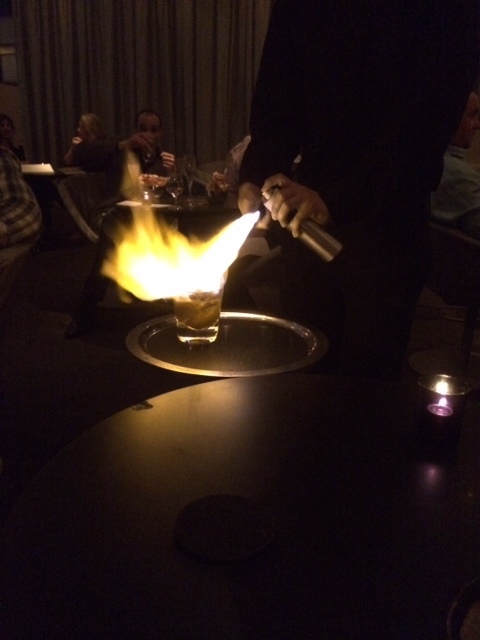 My next stop was at Grant Achatz’s The Aviary, which had been described as molecular gastromony meets cocktail bar. I had failed to gain entry into Achatz’s famed foodie temple, Alinea, but at least I could get a different take here. Located 2 blocks from Moto, The Aviary was hidden behind a large door with a stern looking women with the dreaded clipboard/headset combo. Fortunately, I had been able to secure a reservation in advance and was soon inside. To the right as I walked in, there was an active kitchen and bar known as “The Birdcage” where the drinks and food were being carefully prepared. Unlike most cocktail bars, I couldn’t order at a bar because of said cage so instead I was offered a seat in the main room. A friendly server explained the concept and suggested that I do one of the food/cocktail pairings. I had read in advance about the various options and although the 5 course pairing had some appeal, I concluded having 5 cocktails wouldn’t be a good idea. 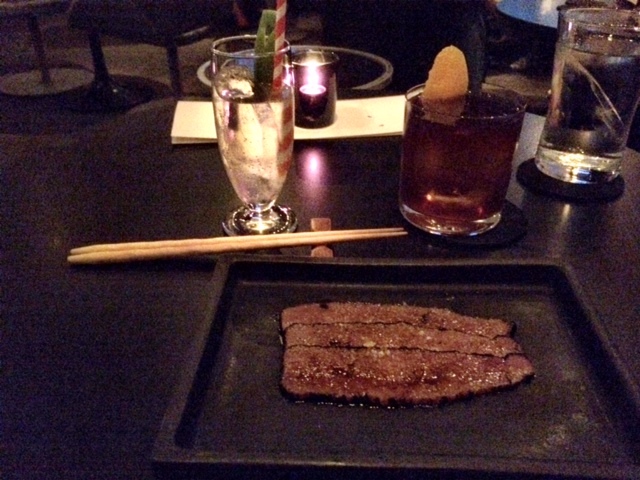 Instead, I chose the 3 course cocktails and decided to do my own food pairings from the small list of ala carte choices. 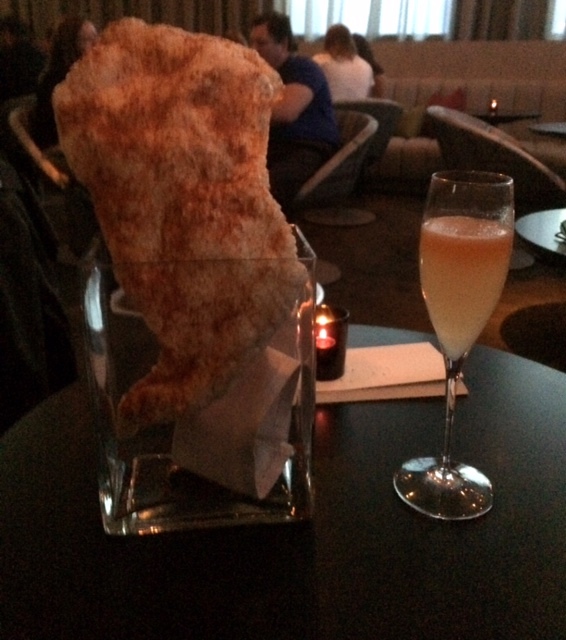 For my first pairing, I had chosen a champagne cocktail with both an orange liqueur and some fresh Valencia oranges with a tincture of smoked paprika – basically a smoky, spicy mimosa. With this, I knew I had to try what was called “BBQ pork”, which was one of their specialties, a massive slab of fried pork skin with some really delicious BBQ powder on it. At first I was intimated by the sheer size of it but some 10 odd minutes later, I was crunching down on the last piece. For my second course, I had been recommended “No Chocolate Here” – which which was a bourbon-based drink with black truffles and cynar. With that, I opted for the A5 Wagyu (basically the best of the best) rib eye with a Dark and Stormy glaze. The server explained that since the beef is so good on its own that it didn’t really need to be paired with anything else. However, they thought that was a bit too Spartan so they added the distilled Dark and Stormy cocktail (which is why it’s not dark) as a complementary cocktail. It was a great choice. Unfortunately though, it made the other cocktail the odd man out with a none too pleasant clash of flavors that just didn’t work for me. My server noticed it was sitting untouched and decided that he’d offer me something else instead. He soon returned with the most theatrical presentation of the evening. After lighting the cocktail with a mix of 151 rum and Campari, the non-flaming version was called “A Moment of Silence” – Angosturra bitters, apry, aveno and rye whiskey. This was a much better pairing than the last one plus, flame on! 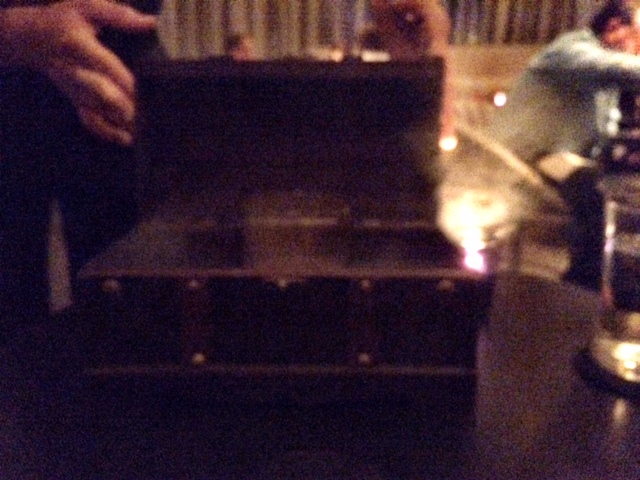 After a brief respite to finish digesting the rich beef I was presented with a leather treasure chest, which when opened had smoke billowing out of it. Inside was a glass that was also swirling with smoke. This was my final cocktail called “Infernal Imagery” – Barolo vermouth, mauria quina (a French liqueur) and rum. I had been told by numerous people that the foie gras Snickers bar was the way to go for my last bite. While not a huge fan of foie gras, I had enjoyed it in the past with a sweet component plus I do love me some Snickers so what the Hell. The cocktail was dense and very complex, with the various liquors and liqueurs somehow not fighting each other. This was needed to combat the overwhelming richness of the candy bar, with the foie gras adding that truly decadent level of taste. I was DONE. Or so I thought. Looking for a night cap but nothing too strong, I was drawn to their small beer list, which included a couple of collaborations with the famous Evil Twin brewery in Belgium. Still, I wasn’t quite finding what I wanted and it turned out that my current server was also in charge of their beer program. She said she would come back with her “baby” from the private room downstairs called The Office. I was soon presented with a very impressive list of beers from some of the most respected brewers in the world, including an entire page of just Evil Twin imperial stouts – my favorite type of beer. Unfortunately they were all in bottles and I was in no condition to have a full bottle of an imperial stout after 4 cocktails. There was one option though from their draft list, a collaboration between The Aviary and Evil Twin. 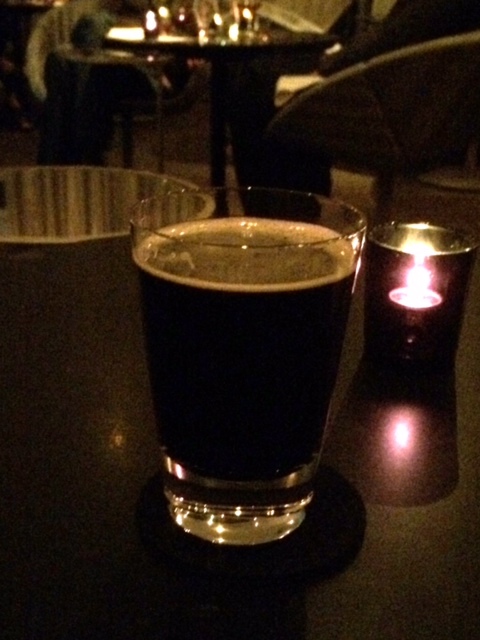 Called “Stalk You Like a Hurricane” it was a smoked porter which also came in a 7 oz half size and a mere 6.9 ABV. It turned out to be the perfect way to end the evening, with a nice coffee-like taste and just a hint of the smoke so as not to overpower. I was surprised how much flavor had been coaxed out of it. Since The Aviary was only 2 blocks from the green line and it was still relatively early, I hopped on the L and headed back to Oak Park. It was a beautiful night so upon arriving, I walked the 1.5 miles back to my friend’s place which also helped me sober up a bit. I crashed immediately, drifting off to sleep with visions of smoky foods and flaming cocktails dancing in my head. Posted on June 20, 2014 by reyalto. Bookmark the permalink.